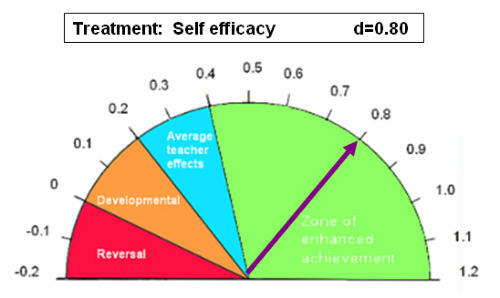 I’m placing a bet on a pony named Self-efficacy. I got the tip from Boaler, Dweck, Hattie, and Marzano. It may come out of the starting gate slow, and it’s a long distance race, but it has incredibly good odds. Take a look at the graphic below. As a rule of thumb any strategy that has an effect size of d > 0.40 is worth considering. There are so many components to increasing self-efficacy: providing timely, constructive feedback, fostering a growth mindset, creating a classroom culture where mistakes are encouraged—all of this should sound familiar to those who are taking Boaler’s course How to Learn Math. But the puzzle piece I want to focus on is building self-efficacy through challenging, individual and group problem solving tasks. Mary will raise students’ self-efficacy in math by providing rich, problem solving activities. She will build into her plan book a minimum of 4 challenging, individual and/or group tasks per quarter. At least one of the tasks will be non-routine or where the problem is not directly linked to the current unit of study. Results will be measured using spring to spring MAP RIT scores. The quantifiable goal is for 80% students to exceed the average growth by one or more points. What do I need to do to take this draft to final form? I appreciate your feedback. Ah, yes!! It’s similar to writing an IEP. Our district doesn’t ask us to submit SMART goals, but I think they can be incredibly valuable. Thanks for your input! I appreciate your post and willingness to create a goal for the school year. I especially like the idea of creating multiple math tasks. Over the past few years my students have been part of the MAP goal setting process. We monitor MAP in conjunction with formative/summative assessment data to create goals. Class and personal goals are set based on multiple data points. My only suggestion is to possibly include math tasks related to the lower RIT value math MAP strands in your class. That way you can incorporate fall/winter data into your tasks and possibly monitor RIT progress along the way. That is an outstanding suggestion, Matt. I have a WIDE range of learners in my standard classes, anywhere from the 15th to 89th percentile. Checking a class’s RIT value in a particular strand helps to identify the types of tasks to present. Types meaning both cognitive demand and concept. Thank you for your input! I plan to post a revised goal based on the recommendations here in the comments. Before I do I want to wait for additional feedback. I really love the idea of creating a SMART goal for yourself – and I love the goal you have set. So frequently we are asked to do this as part of exercises in school, and the goals, when forced upon teachers, don’t have true meaning. But here you have created a goal which is meaningful to you, achievable (you have quantified how you are going to achieve this goal, and how you will measure it), and realistic. Moreover, your participation in the How to Learn Math course has given you the tools to succeed. Thanks for sharing this! Thanks, Wendy. I was a part of our district’s teacher evaluation committee and had advocated for a goal setting component but it wasn’t included in the new plan. The intent isn’t to be a gotcha! but something that is the meaningful to the individual teacher as well as something that administration will support with time, treasure, and talent. I think trust and the environment in which we’re asked to create a goal are factors. Goal setting when sprung on you at a faculty sends a message that this is merely an agenda item to cross out. I can’t tell you how many hours I spent thinking about this goal and wondering how will I know if I’m successful.